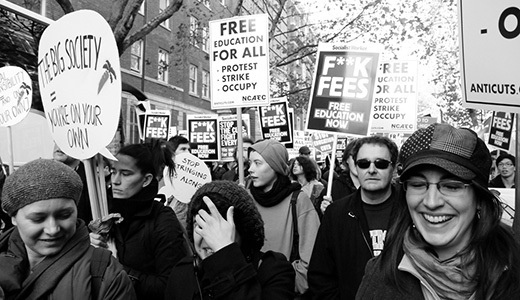 LONDON (Morning Star) – Students will mark Deputy Prime Minister Nick Clegg’s birthday this Friday by marching on his party’s headquarters as a reminder that young people have not forgotten about his tuition fees betrayal. This year’s first wave of action will be followed by a national walkout from schools, colleges and universities by students on January 29 and three days later national demonstrations will be held in London and Manchester. A fresh round of occupations is also expected when universities announce their new tuition fees before the end of February. A National Campaign Against Fees and Cuts spokesman said that students might have been on holiday but were “still pissed off” at the withdrawal of EMA (education maintenance allowance) and the rise in fees. This afternoon the eight-week long occupation of the University of Kent ended.